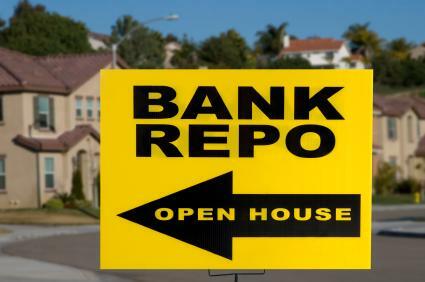 Bank foreclosure auctions allow banks in ownership of real estate to sell property that has been defaulted on so they can recoup their investment. For buyers, this may signal an opportunity to save money when buying a home. A bank may hold an auction to sell property if, after a mortgage holder defaults on the loan, the lender takes ownership of that property. This can happen in two ways. First, the lender may take possession of the property by forming a contract with the property owner during the pre-foreclosure process. Second, the lender may also purchase the property at a public auction. A lender in possession of real estate often wants to sell the property quickly. An auction allows the lender to recover much of the unpaid loan value quickly through a sale. Some lenders will maintain the property and handle important repairs while in ownership of the property. However, most foreclosure auctions are "as is," meaning the lender is unlikely to make changes to the property for the sale to occur. Anyone who wishes to purchase a home can do so through foreclosure auctions as long as the person has the financial means to do so. Before buying, it is critical that buyers understand the process and potential limitations of such a transaction. Often, auctions allow buyers to purchase real estate less expensively than purchasing on the market, but this is not always the case. According to RealtyTrac.com, residential real estate auctions are the fastest growing sector in property auctions. In 2006, this sector saw an increase of 12.5 percent and generated $16 billion in sales alone. Consumers can take advantage of this discounted property by participating in local auctions. Some lenders hire auction houses to handle the sale of the property. The following tips can help you in these auctions. Most auctions require bidders to pre-register with the auction house. Most require winning bidders to pay a deposit immediately upon the purchase of the property. This is usually between five and 10 percent of the property's sale price. Some auction houses require payment in full at the time of purchase. The sale must close within 30 days of the sale, usually with a cash payment for the remainder of the balance. Homebuyers assume the risks of the property, including any repairs. It is a good idea to inspect the property prior to the auction. A bidding war can lead to the sale price of the property rising significantly. The highest bidder wins. This can affect the affordability of the property. Property ownership through foreclosure sales can be impossible for those with limited capital to purchase and renovate the property. Tenants living in the property may be unable or unwilling to move quickly. Although the lender will turn over the title on the property at the time of auction, a real estate attorney working for you should clear the title of any ownership concerns. Those interested in participating in bank foreclosure auctions can do so by researching options online. Most auction houses provide websites or informative mailings to interested participants. RealtyTrac.com offers foreclosure auction listings on its website. Narrow down the options by real estate owned (REO), or bank owned property, to find these specific property options. For national options, ForeclosureListing.com offers a tool to help you to find foreclosure auctions occurring throughout the country. Williams & Williams is a real estate auction house. You can find listings for foreclosure auctions throughout the world through the Williams & Williams website. You can also locate local auction houses to find out when auctions are occurring. If you know who the lender on a specific parcel of property is, contact them to request information about the auctioning of the property. Most auction houses will provide detailed information about the auction with registration information on a website. Others may have a local office for interested parties to visit. Give yourself at least 30 days to locate properties and to get financial affairs in order prior to investing, if possible.